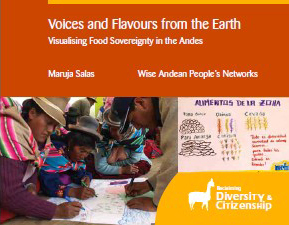 Voices and flavours of the earth: Visualising food sovereignty in the Andes (Los Sabores y las Voces de la Tierra: Visualizando la Soberanía Alimentaria en los Andes) is a multimedia publication that uses video, audio, images and text to describe how indigenous communities are drawing on their knowledge and cosmovisions to rethink the priorities and governance of food and agricultural research in the Andean Altiplano of Bolivia and Peru. The work presented here is part of a larger international and multi-regional initiative known as Democratising the Governance of Food Systems. Citizens Rethinking Food and Agricultural Research for the Public Good. Sabino Cutipa: Coordinator of Programa Andino de Soberania Alimentaria (PASA).